I finally got the tree up. 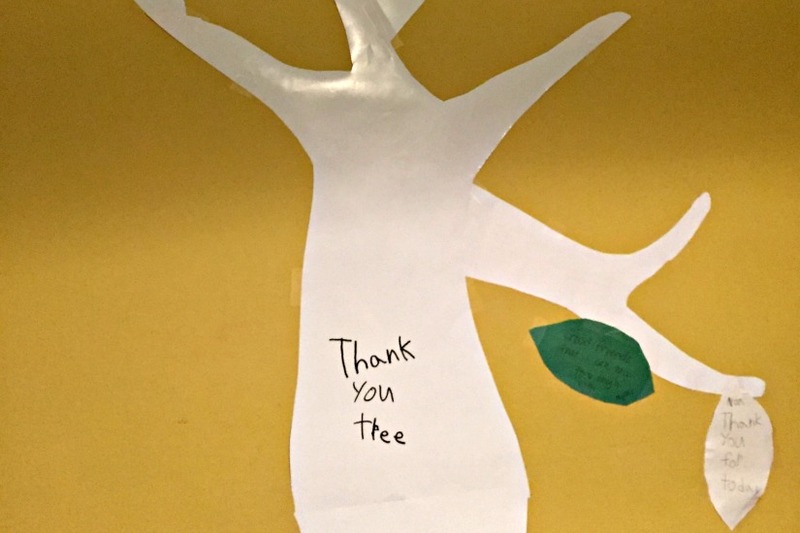 Not our Christmas tree, but our Gratitude or Thank You Tree. I’ve been meaning to do this for about two years, but never got around to it. This year, I was determined to do it and here it is. It’s not that pretty, but it’s going to get the job done. We are a few days behind in adding leaves, but we’ll catch up. I’m not much of an artist, but Ninjette and I cut a trunk out of old posters and also added some branches. We may add some more branches, but we’re hoping that the leaves will cover everything. Ninjette cut out all the leaves that are ready for writing what we are thankful for and also any prayers we want to add to it. Who doesn’t need a little more prayer, right? When the weather gets colder and the darkness comes sooner, it’s easy for me to just complain. This tree will be a great way for our family to focus on the positive and to remind me that I have a lot of things to be thankful for. One of the things that I am really thankful for today are good friends. The kinds of friends that I can have serious talks with, but also have a really good laugh with. Some of my friends I met through my online and blogging community. It has been the greatest blessing to me to have them become my IRL friends as well. We meet up, we talk, we check in, we support and we care for one another deeply. Some of my other friends are the ones that I’ve known since I was little. I am thankful that things like Facebook help me to keep in touch with them and reconnect with them. It’s also fun to see where they are and to see pictures of their kids. I forget that we are all getting older and not still elementary, junior high or high schoolers anymore. I’m also really thankful for my friends that I have made here in Boston. They have become my family. They are the ones that have come to help me when I was down; the ones that I asked for advice when parenting got hard; the ones that have taught me about grace in ways that I didn’t know were possible. I am most thankful for my friend, S, though. She is the one that is my true kindred spirit. I still have the handwritten letter she wrote to me in college – it has made all the moves I’ve done for the past 20 years! Every once in a while, I will go find that letter and re-read it. It is unfortunate that we don’t live in the same city anymore, but the closeness I feel seems to go beyond geography. By the way, if you come over to our house, we will ask you to add a leaf of gratitude to our tree. So, who is coming over? What are some things that you are thankful for? What would your leaf say? i love this so much! And you too! This is such a wonderful idea and something my family could use in our lives. Thank you for sharing. We’re going to try this, too! Awesome! Would love to see pics of your tree! This is such a fantastic idea! I would like to do something like this with Eve when she gets older. Yeah, my friends do this with their two year old, too! It’s kind of cool and so cute!